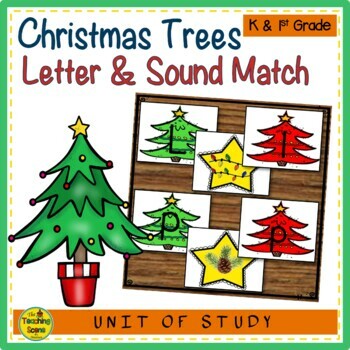 Christmas Trees Letter & Sound Match Activity to Practice the Phonemic Awareness! Resource Prep: Print, laminate and cut all cards and pieces to the activity. Directions are also located on the game card set. Note: You can choose to do all the cards or take out the letters and sounds you are working on at the time. 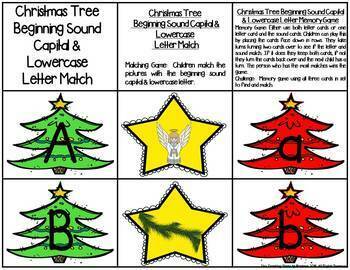 Christmas Trees Beginning Sound Capital & Lowercase Letter Match: Matching Game: Children match the pictures with the beginning sound capital & lowercase letter. Memory Game: Either use both letter cards or one letter card and the sound cards. Children can play this by placing the cards face down in rows. They take turns turning two cards over to see if the letter and sound match. If it does they keep both cards, if not they turn the cards back over and the next child has a turn. The person who has the most matches wins the game. Challenge: Memory game using all three cards in set to find and match. 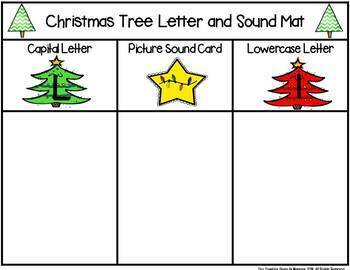 Christmas Trees Letter & Sound Mat: Children can use these mats to help organize there letters and sound cards. Good resource for students who are just learning the letters and sounds or for those students who need visual aids. 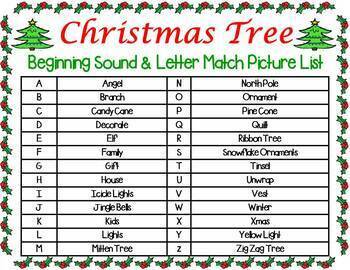 Kids have some Christmas Tree fun while learning the sound symbol connection!